No. 24 Florida Gators basketball (17-5, 7-2 SEC) won its third straight game by 30 points or more via a 93-54 rout of the Missouri Tigers (5-16, 0-9 SEC) on Thursday night at the Stephen C. O’Connell Center in Gainesville, Florida. 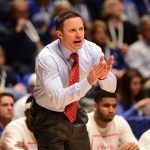 OnlyGators.com breaks down the latest win below. It was over when … The game started. Seriously. The Gators led by 10 at the first timeout, 21 after nine minutes and 30 early in the second half. It was never a contest. Florida made its shots, defended and rebounded, playing inspired for the third straight game. Exceptional efforts: Junior point guard Chris Chiozza became the first player since Nick Calathes in 2009 to record a triple-double for the Gators. Chiozza scored 12 points, grabbed 12 boards and dropped 10 dimes — three in the final four minutes — on his way to the mark as UF went 3-for-9 on assist opportunities down the stretch. Say it with me, folks. Sophomore guard KeVaughn Allen made his first three shots to create the early lead and finished with 15 points on the evening with most of his scoring coming in the first half. 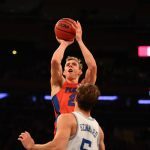 The opposite was true for graduate transfer G Canyon Barry, who hit a couple threes in the second half and all five of his free throws on the way to a team-high 17 points on the evening. Significant stats: Florida absolutely dominated Missouri, holding it to 30.2 percent shooting on the evening and just 11-of-42 from inside the arc. The Gators bench once again outscored its starters 47-46, a key to their dominant victories over the last month. It wasn’t all scoring, though. UF beat Mizzou 56-32 on the boards and 19-9 on second-chance points. Odds and ends: There’s not much else to take away from this game other to note that that UF once again performed well from the charity stripe, hitting 22-of-27 free throws on the evening … the Gators also led for 39:13 of the 40-minute game with the contest tied 0-0 for the first 24 seconds. What it means: Like the last two games, not much. 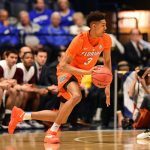 The Gators were favored by nearly 21 points against the Tigers and covered that spread just nine minutes into the game. UF improves to 17-1 against unranked opponents on the season and has won three straight games after a difficult stretch. Up next: With just 48 hours of rest, Florida will host Kentucky on Saturday at 8:15 p.m. on ESPN. “College GameDay” will be in town that day and air live from Gainesville in the afternoon. The Wildcats have not played since Tuesday.